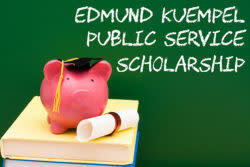 Each year the Texas Legislative Conference awards the Edmund Kuempel Public Service Scholarship to two area high school students who are pursuing a future in public service. The scholarship is available to students at Canyon, New Braunfels, Seguin and Navarro high schools who plan to attend a college, university or trade school in Texas and concentrate in government and/or public service to include, but not limited to, Political Science, Public Administration, Legal Studies, Law Enforcement, Military Service, Firefighter Training, Education, Non-profit Management, and Public Safety. The purpose of the scholarship program is to provide financial assistance to high school seniors who are interested in pursuing studies in government and/or public service. Scholarships can be applied toward tuition, fees, books and/or housing. This is a one-time $1,000 scholarship. The scholarship recipients will be recognized at the Texas Legislative Conference on Friday, March 23. The deadline to submit the application is March 1, 2018. For more information or to apply for the scholarship, visit www.InNewBraunfels.com/TLC/Scholarship.